February 25, 2015 In News What is Michelle doing now? This 125-year-old state-of-the-art luxury hotel is a classic, historic property. 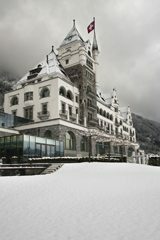 A shot of the Hotel Vitznau in winter from Lake Lucerne. One of the things that Michelle always highlights in her hotel photography Keynote speeches is that hotels have completely different seasons, so they should be marketed almost as separate products. It is so important to embrace seasonality in a hotel’s marketing collateral. Dramatic skies over the snowy gardens at the Hotel Vitznau. Hotel Essence carried out a shoot for PHV in May with superb climatological conditions – bright sunshine, blue skies and a smooth lake. Michelle was then re-commissioned to capture the property in winter, surrounded by a magical snow-covered landscape. Mist rising from the infinity pool in the frosty weather. The indoor-outdoor infinity pool is one of the most photogenic hotel swimming pools in the world. On crisp winter days, steam rises from the floodlit heated outdoor pool, which has an incredible view to the lake. Michelle and her crew captured details, landscapes, interior and exterior shots. It is always a pleasure to return to a property you’ve already photographed, as both the crew and the management are familiar with all the idiosyncrasies of photo-shoot timescales and logistics, so it’s a much smoother run. Brandy glasses sitting on a bed of snow. 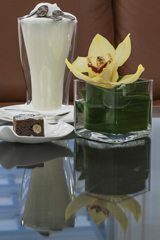 Hotel photography should ideally be a long-term relationship between the photographer and the management. Rapport has been built on the previous shoot, so everyone knows each other, and whom to ask for what; the crew is familiar with the property, its layout, the light, the angles, which times of the day are best to avoid disturbing guests – a second shoot is considerably more time-efficient in general. This is one beautiful hotel in spring and stunning in winter. 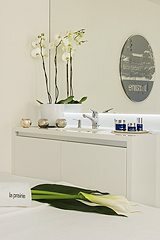 La Prairie Spa reception at the Hotel Vitznau. As well as shooting luxury hotels around the world, Michelle photographs complementary products of a similarly outstanding quality which can be found in the finest properties. 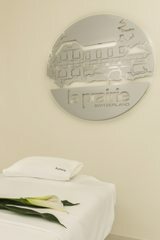 Whilst on assignment for Park Hotel Vitznau in Switzerland, Michelle created images for the Swiss premium skincare company La Prairie, including two treatment rooms and the full display of their product range in the hotel spa’s reception, along with the spa staff. 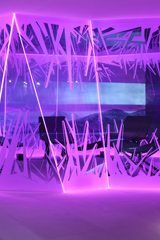 The images were approved by La Prairie head office in New York and are now available for press syndication. Michelle´s photo featured in GQ Magazine. GQ (formerly Gentlemen’s Quarterly) is an American monthly men’s magazine based in New York City. The publication covers fashion, style, travel and culture. In a recent edition they published a feature on the 10 Best Hotel Pools in the world. 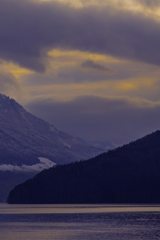 The photo used to illustrate Park Hotel Vitznau was Michelle’s shot of their pool taken at sunset – in the foreground is the infinity pool, seamlessly moving into Lake Lucerne, and in the background the Swiss Alps. A very tempting pool indeed. Michelle had a memorable luxe-inflight-cinematic experience – watching the highly entertaining movie Grand Hotel Budapest while travelling in seat 1A of a brand-new British Airways Dreamliner – back in October. A pleasant experience on board a BA Dreamliner. Seeing the movie win its Oscars in February brought back wonderful travel memories of Michelle´s flight in the new BA Dreamliner with private pods, high-tech entertainment system, ambient mood lighting and large, dimmable windows. Photography is not only about taking photos; it’s also about the journey you take to the destination. Travel photography is indeed a wonderful thing! A misty morning at the Hotel Vitznau. The Swiss flag flies high at the Vitznau. 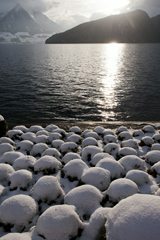 Snow-covered gardens by Lake Lucerne. Fresh flowers and La Prairie products.